Hawaiians used spears to fish in shallows or along rocky ledges, or underwater to catch rock fishes. Hard woods like kauila, o`a, koai`e, and uhiuhi were favored for spears. Finished spears were six or seven feet long, slim and sharply pointed at one end. Night spear fishing inside the reef was done by the light of kukui-nut torches as the bright light attracted fish in shallow waters. 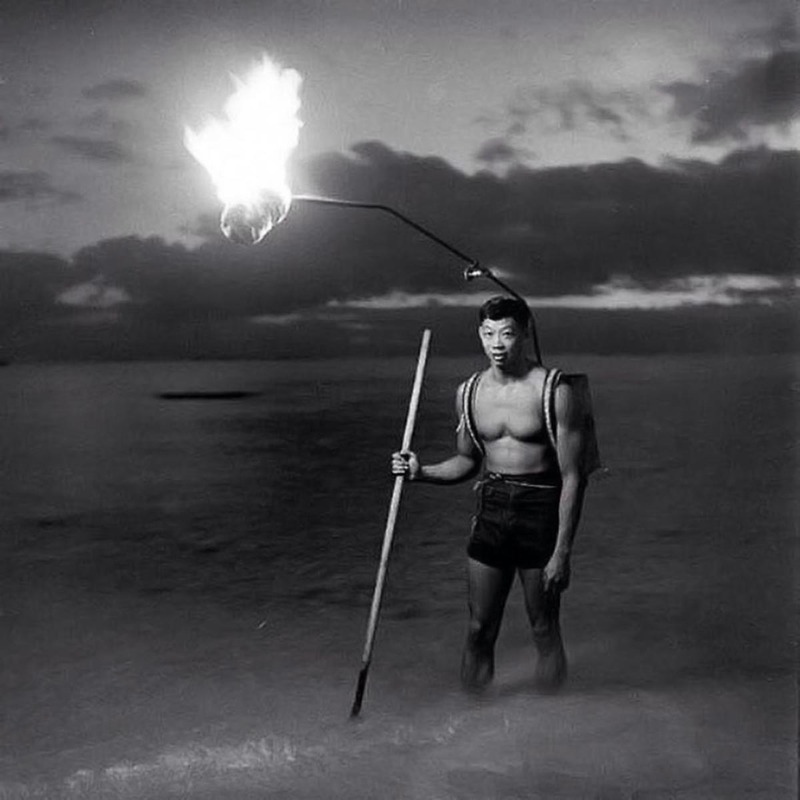 Fishermen made torches out of kukui nuts wrapped in leaves on top of a pole. The lamaku was a large torch made out of a short piece of the coconut leaf midrib. On the midrib, they would string kukui kernels to make the torch. If the Hawaiians wanted a brighter light they put roasted kukui nuts in a hollow piece of bamboo and lit them. Ancient Hawaiians drew their sustenance – physical and spiritual – from the land and sea around them. Guided by a philosophy that paired a cycle of cultivating and harvesting plants and animals with conservation of those resources, they lived in balance with their environment. Within this context, fishing held a central role. Seafood provided the primary protein in the Hawaiian diet, complementing vegetable staples such as taro, sweet potato and breadfruit. Ocean resources were so important that the ahupua`a system of land division ensured each district had access to the sea along a swath of shoreline and beyond to fisheries. Within each pie-shaped division, fishing communities exchanged with upland farmers, supplying fish, shellfish, seaweed, and salt to the entire district. Fishermen maintained personal and spiritual relationships with the sea, acquiring extensive knowledge of shore and reef areas, honing their diving skills to locate fish, spear fish, free nets, and set traps. The many proverbs, prayers, and tales attest to the importance of fishing in Hawaiian culture. A successful fisherman was a highly valued asset for his entire community. The historian Kamakau wrote that the fortunate fisherman “was like a lucky woman who attracts men by the fragrance of her skin”.